My Seattle buddies we're nice enough to support my cupcake mission and they brought me to the Ballard branch of Cupcake Royale. The store is on this adorable tree lined street with all sorts of cute little shops. I was instantly charmed by how bright and spacious the shop was. It would definitely be a nice place to hang out or meet for coffee. And then there were the cupcakes! Yum! 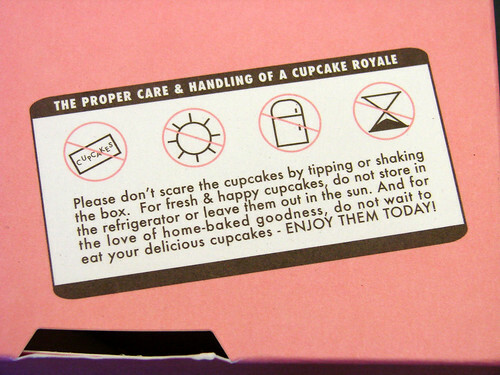 Apparently Cupcake Royale cupcakes have a very nervous constitution. You shouldn't shake the box...they'll get scared. Also, you shouldn't bang on the glass...that scares them, too. 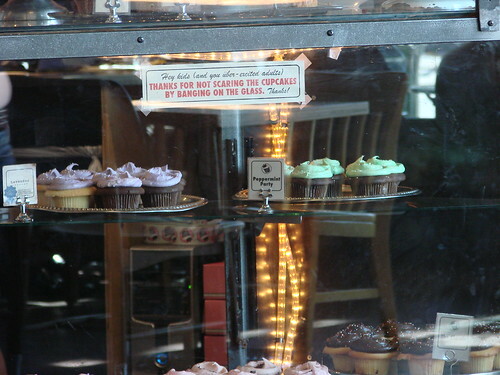 Also, apparently you're not allowed to take photos of the cupcakes. Or at least I wasn't. There I was, beaming at the lovely little cupcakes and snapping a couple of pics of the case and the lady behind the counter told me I couldn't take photos. She was nice-ish about it (certainly nicer than the extremely scary Greek lady), but it was still a bummer. There wasn't anyone in line behind me so I wasn't holding anyone up or blocking anyone's view of the case. 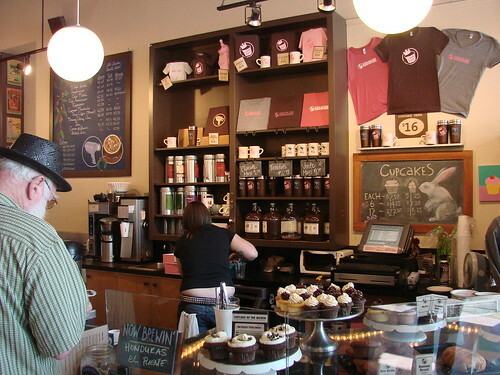 I had heard so much about Cupcake Royale I was excited to be there and wanted to document the experience. Fortunately I got some good photos before she made me stop--I'll admit I snuck a couple extra pics after of the lavender cupcake (after it was bought and paid for). My friends told me that they've never had problems taking photos there before so maybe it was just a fluke. I've actually had lavender in food before. It was high school. Lavender sorbet. I thought it was kind of tasty. Kind of weird. Still do. But...it was different. And intriguing. And I'll try pretty much any dessert at least once. The lavender cupcake was actually quite good. The cake was nice and moist and the frosting was sweet but not too sweet. 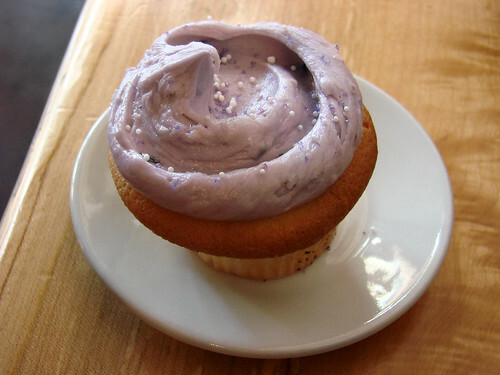 And the lavender flowers added a hint of sophistication to the cupcake experience. It's not a cupcake I would crave per se, but definitely something I would recommend for a party or to give as a hostess gift. I only had a chance to try the Lavender Cupcake, so I can't comment on the other cupcakes, but if the Lavender Cupcake is indicative of the rest of the bunch, I'd totally buy a box of these for a party if I lived in Seattle. Any Seattle-ites out there? What do you think of Cupcake Royale? 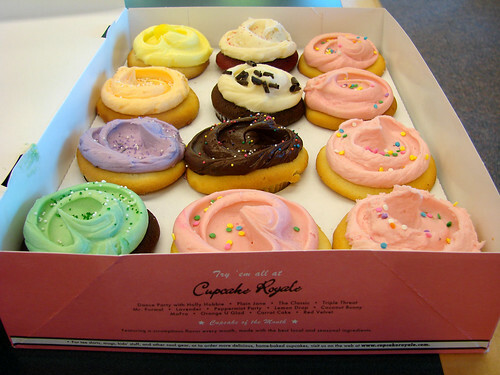 For more Cupcake Royale pics check out our flickr. 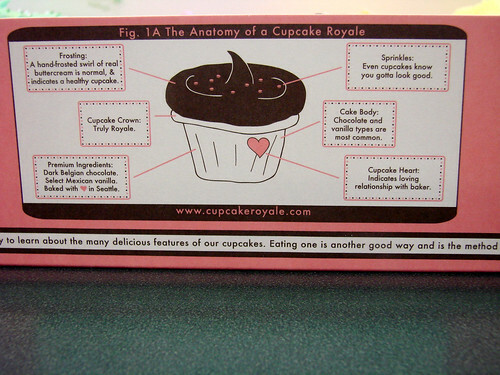 I'm a Seattleite (via Brooklyn) and I love Cupcake Royale. 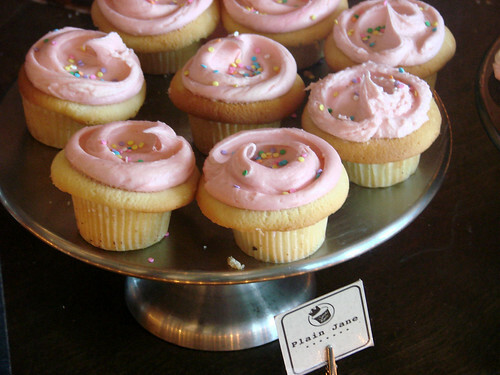 Their cupcakes are sweet and simple. 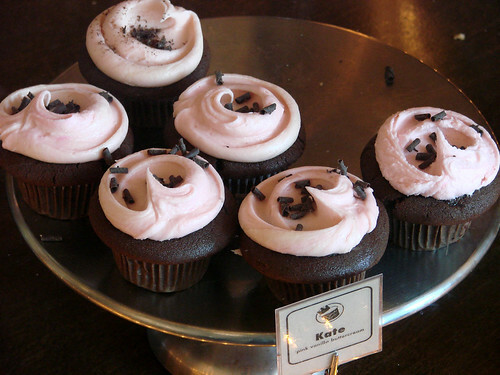 To me, they are exactly what a Seattle cupcakerie should be: Not too fancy, frilly or cutesy. Not too pricey. Definitely not Martha Stewart. And totally cool. 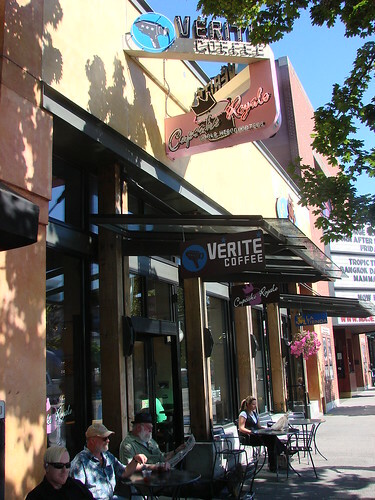 Plus, they take their coffee very seriously, and they use local ingredients.